Queen Victoria was the first to wear a white gown for her wedding in 1840, and women began to copy her, creating a tradition. Queen Victoria was not the first to wear a white wedding dress, but it experienced a boom in popularity as a result of her marriage. Queen Victoria was not the first to wear a white wedding dress, but it was only with her marriage that it took on the connotations of purity and innocence. There is a surprisingly tremendous amount of evidence that women wore white as brides whenever possible, and that brides were idealized as pure virgins in white, from a much earlier date than the 1840s. Now, it does have to be said that the plain and extremely bright white common today seems to date largely from the twentieth century - but there is a common thread of using white or off-white for much longer. 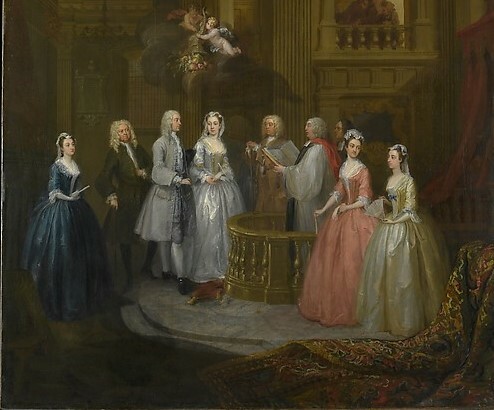 While a fictional representation (and technically more suited to the next post), the bride in Hogarth's "Marriage-à-la-Mode" series is, in the image which shows the actual marriage, dressed in a white silk sacque, also trimmed with gold. Later on we have more evidence, and it frequently shows wedding gowns being white-grounded silks brocaded in fashionable floral patterns. In 1760, the young Mary Tipping had to send to her future siblings-in-law in London to purchase the fabric for her wedding negligée and petticoat, as described in Anne Buck's Dress in Eighteenth-Century England: damasked white silk with "a few coloured flowers interspersed." 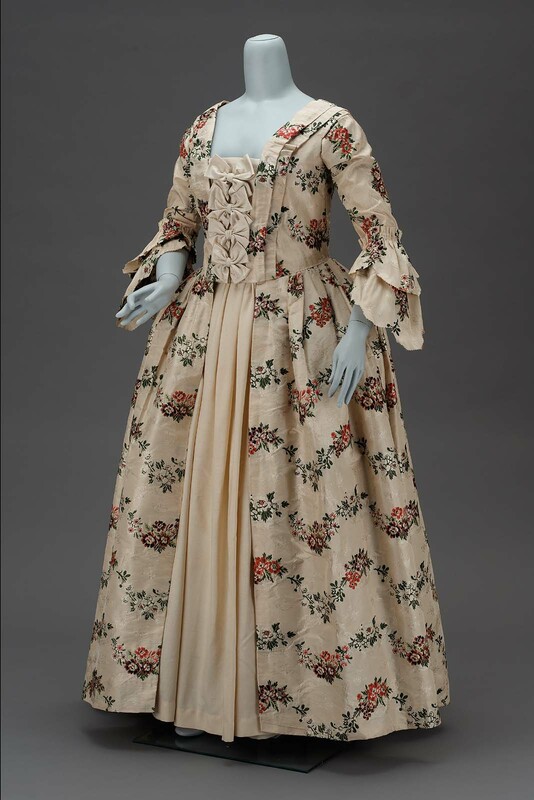 The gown worn by Sarah Tyng Smith when she married Richard Codman in Portland, Maine in 1763 was made of a silk similar to that. 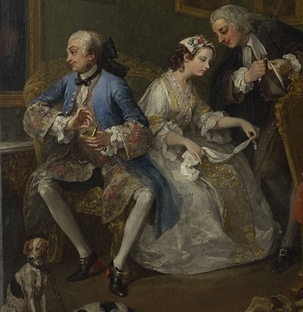 Even Lady Cowper's maid managed to have "a new white satin nightgown and petticoat, a white spotted satin cloak" for her wedding in 1768 (again described by Buck). White and silver came into prominence for non-royal weddings with the rise of Neoclassical styles during the 1770s. Elizabeth Fenimore Cooper's 1774 wedding dress is still extant – a sacque and petticoat made of a silvery-white silk satin, trimmed with the same. The wedding gown and petticoat worn by Sarah Boddicott in 1779 were of white silk taffeta woven with silver leaves, trimmed with silver fringe. 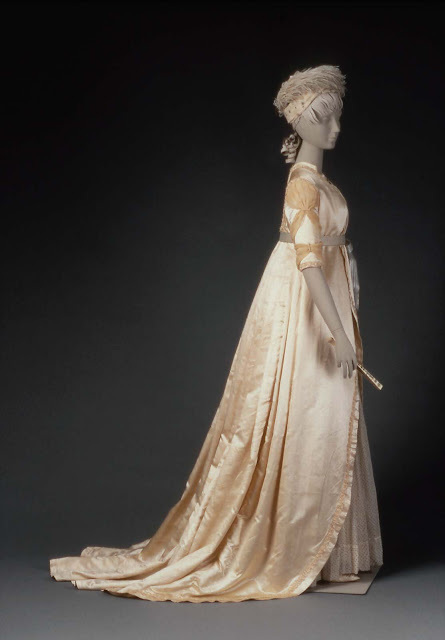 Mary, the daughter of the Marchioness Grey, had a difficult time finding a white and silver brocaded silk for her wedding dress in 1780, hoped for at least a white and gold, and kept a plain white satin in reserve. (Again from Buck.) In a letter from Mrs. Delaney's Correspondence, Emilia Clayton describes her dear Marianne's 1786 marriage in great detail. In addition to a number of pieces of jewelry, she describes "a silver muslin night-gown trimmed with white sattin, a very fine sprigged muslin apron, and handkerchief trimmed with beautiful lace, and white and silver shoes". Plain white came into greater prominence in ordinary dress around this time, and was particularly fashionable in cotton muslin. To elevate the muslin into being appropriate for a bride on her special day, white or off-white silks would often be added to the ensemble in some way. Eunice Hooper's 1799 wedding gown was made of off-white satin, worn with a silver-spangled mull muslin petticoat. 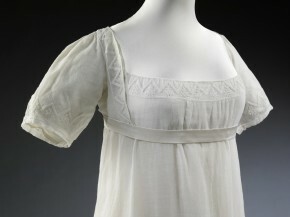 Lady H. Villiers's 1807 wedding gown was described in La Belle Assemblée as being of "the finest India cobweb muslin … over a soft and highly polished satin slip" and worn with a pelisse of a French white satin; Mary Dalton Norcliffe married in the same year in a very fine worked muslin gown, which would most likely have also been worn over a silk slip. A notable exception to the trend of combining fabrics is the 1809 wedding dress of Lydia Poultney, which was made of satin; the wearer was a Quaker, and was therefore avoiding ostentation, but still conformed to tradition in its pale shade. The white lace wedding dress came into use in the early nineteenth century, perhaps to separate the wedding dress from ordinary ball dress, which was generally a trimmed net or gauze gown worn over a silk slip. The wedding dress worn by Tylney Long Pole in 1812 "consisted of a robe of real Brussels point lace; the device a simple sprig; it was placed over white satin. The head was ornamented with a cottage bonnet, of the same materials … She likewise wore a deep lace veil, and a white satin pelisse, trimmed with swansdown." An 1816 bridal fashion plate also shows a gown of "striped French gauze over a white satin slip; the bottom of the frock is superbly trimmed with a deep flounce of Brussels lace, which is surmounted by a single tuck of byas [sic] white satin and a wreath of roses." While lace continued to be an important part of expensive wedding dress, satin came back into prominence at about the same time that colors returned to fashion. Charlotte Cooley and Sophia Donaldson were both married in fairly plain white satin gowns on either side of the Atlantic in 1820 and 1821. Silver and Neoclassicism were by this time no longer in style, and a wedding dress was more likely to combine different shades of white and off-white satin, as on that worn by Eliza Larken in 1828. 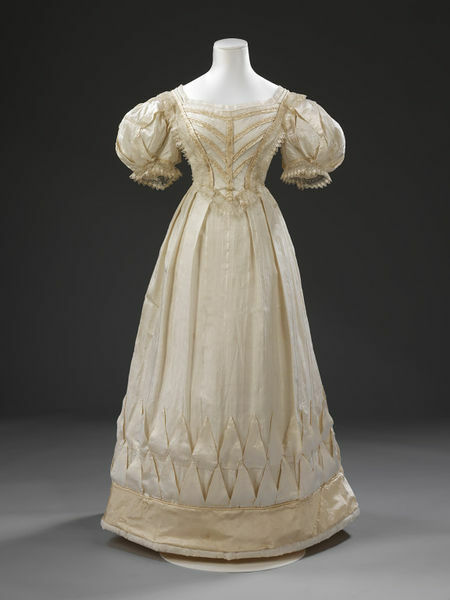 One dress shown in Ackermann's Repository in 1829 paired the Brussels lace gown with a white satin pelisse, and another from a few years before partially covered it with a satin sash. 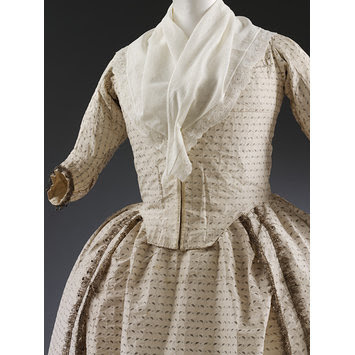 Later in the Bourbon Restoration, the fashions of the mid-eighteenth century returned to the fore, including figured, damasked, and brocaded white silk – the former being seen on the wedding dress worn by Lucy Ann Lane in 1835. As you can see, this is the first post of a short series! Join me next time for a discussion of the white wedding dress as a cultural ideal during this period. Want to help turn my obsessiveness onto a topic of your choosing? Please check out my Patreon!